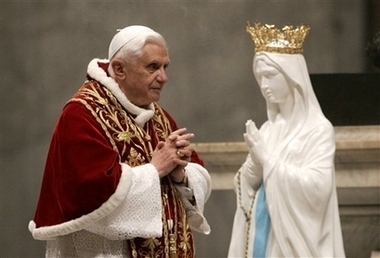 From the very beginning of his papacy, Benedict XVI implored the intercession of the Virgin Mother of God. After the glorious announcement of Habemus Papamin 2005, Pope Benedict concluded his opening remarks with “In the joy of the Risen Lord, trusting in His permanent help, as we go forward the Lord will help us, and His Mother, Mary Most Holy, will be at our side. Thank you.” With this, Benedict expressed the desire for Mary to journey alongside him as he would lead the pilgrim Church on earth. It is fitting then, that as Benedict XVI announced his abdication of the papacy, in the ensuing days, he would seek the intercession of the Mother of God, as both he and the Church move forward beyond his papacy. Much has already been written on the date chosen by Pope Benedict to announce his abdication, February 11th, the feast of Our Lady of Lourdes. From the very date then, the abdication already had a Marian undertone. The Marian dimension was only furthered when Benedict declared at the end of the address: “And now, let us entrust the Holy Church to the care of Our Supreme Pastor, Our Lord Jesus Christ, and implore his holy Mother Mary, so that she may assist the Cardinal Fathers with her maternal solicitude, in electing a new Supreme Pontiff.” The Cardinals of the Church are now in Rome, preparing for the conclave. Now would be a good time to heed the advice of Benedict, to seek the intercession of Mary in the election of the new Pontiff. Benedict referred to Mary’s maternal solicitude, that is, her great concern for the Church. As the Mother of the Church, Mary’s role is to make intercession on her behalf so that the Church will not falter. We would do well to pray for Mary’s intercession over the conclave as the Cardinals prepare to elect the new Pontifex Maximus. March 2, 2013 in Abdication, Benedict XVI.